The Boston & Middleborough Clothing Company, founded in 1889, was the forerunner of the Middleboro Clothing Company. Initially owned and managed by Frederick D. Martin and Thomas Ellis, the Clothing Company operated a store in the American Building on South Main Street near the Four Corners. 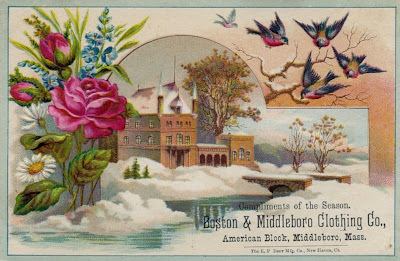 Like many businesses of the period, the Boston & Middleborough Clothing Company advertised through means of colorful lithographic trade cards, including the seasonal one shown above. Boston & Middleborough Clothing Co., lithographic advertising trade card, E. P. Best Manufacturing Company, New Haven, CT, c. 1890.